This was said by veteran Director Elwood Perez about how to manage to stand out in a currently diluted film industry today. He held an interesting talk at MINT last April 4. He arrived with quite an entourage which consisted of a three-people camera crew, plus two actors, garbed in traditional Barong Tagalog. Elwood Perez is an esteemed filmmaker in the 1980s, with a number of award-winning films under his name. He is also a beloved figure in Regal Films, a movie production company founded by film matriarch Lily Monteverde in the 1960s. His most famous titles are “Ang Totoong Buhay ni Pacita M.” (1991); “Bilangin ang Bituin sa Langit” (1989); and “Ibulong mo sa Diyos” (1988). The director’s talk can be best described as spontaneous and eccentric. Given his decades-worth of experience in film, “El Maestro” had something different in mind. Perez enjoined his audience in a short skit shoot of a ribbon-cutting scene. He guided the participants in an onslaught of instructions on how to perfectly execute the scene. Even if the students were baffled as to what is really happening, they gamely followed Perez’s direction. Phones were raised to capture the moment, along with the cameras of the director’s own crew. It took a few retakes before the director felt the need to shout “cut!” to everyone in the room. Apparently, this abrupt exercise is the culmination of the points he raised during the lecture proper. Just like the scene he directed, there are various films who always incorporate ribbon cuttings. 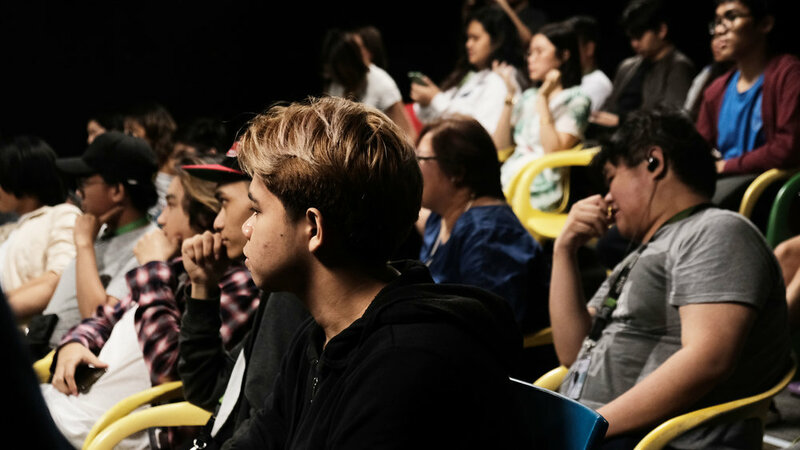 But Perez reminded the aspiring filmmakers to always pursue their “own take” on the usual scenes. “Your trademark [is your own] way of interpreting it and ‘owning’ it,” he said. “[Your style] should be that no matter where it is placed and faced; you would know that it came from the person who originally thought of it,” he said. He then enumerated names in the film industry who managed to make a name for themselves through their own visual interpretation of scenes, or what filmmakers call as “mise-en-scenes”. He named Tim Burton as an example. The visual aesthetics of his film became his own branding. The goth visual treatment of the scenes became Burton’s own, that if any director who will try the said aesthetic would be called ‘Burton-inspired’. He challenged the students to be mindful of their own styles. “[Develop styles] that won’t be owned by the world or some mainstream company. Everyone should know it’s you,” he added. He also shared advice on how to properly direct their actors to enact a scene. Making a frame aesthetically-pleasing is just a part of the whole creative process that filmmakers do. A film would only be as good as its actors. In the skit shoot, Perez demonstrated to everyone how to direct actors for a scene. As the director himself, he explained clearly the sequence of the shot and how they should position themselves in the frame and how to carry out the role given to them. ANGEL FLORENCE PUA is a senior high school Film student in MINT College who is deeply in love with learning, creating and almost anything concerning the Arts. She is a passionate individual with a heart for God and determination to share her stories and those of others to the world.